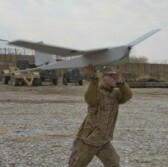 AeroVironment has supplied two Defense Department customers with company-built Raven and Puma AE unmanned aircraft systems that are compatible with M1/M2/M5 radio frequencies. The company said Tuesday it will also begin to offer M1/M2/M5-configured Wasp AE micro air vehicles in December then conduct deliveries in spring 2018. David Sharpin, vice president of AeroVironment’s tactical UAS business unit, said the company integrated the M1/M2/M5 frequencies into its line of small UAS to help clients comply with DoD’s new frequency spectrum allocation. AeroVironment also launched the Pocket DDL AE rugged digital video and data receiver that incorporates the new M1/M2/M5 RF spectrum. Pocket DDL AE is designed to facilitate access to a small UAS digital data link network and support operations in various environmental conditions. AeroVironment plans to introduce further updates to its UAS portfolio at the Association of the Army’s annual meeting in October.